Posted on: 27 Nov ’14 By: MonnetFiled under Uncategorized. Tagged programming. Posted on: 25 Mar ’14 By: Theatre CentreFiled under What's On. 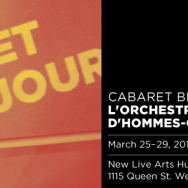 Tagged Cabaret Brise-Jour, Kurt Weill, L'Orchestre d'Hommes-Orchestres, LODHO, music, New Home, Performance, Performing arts, programming, Quebec, Quebec City, The Theatre Centre, theatre.